As Britain commemorates the First World War a writer seeks out and listens to some of the women who created Britain's most compelling peace movement. Cruise missiles left Greenham Common in March 1991, but Sarah Hipperson continued to protest until the land was returned to the people of Newbury nine years later. The 87-year-old campaigner was one of the last women to leave the peace camp at Greenham Common. I interviewed her at home in East London for an article on the legacy of the women’s peace protest. Born in Glasgow in 1927, Sarah had raised five children and worked as a nurse for several decades when she happened upon Greenham in 1983. “When Greenham came on it offered me the perfect work. I have always been a worker. I have worked since I was 16. I didn’t go into higher education or anything like that. Sarah has worked for decades on one cause or another relating to Greenham Common. First, during the 1980s when she joined the women-only peace camp outside the United States Army Airforce nuclear base located on the Common. Then, once the missiles left, Sarah continued to campaign for the return of the Common to the people. In 1997 Newbury District Council acquired the Common from the Ministry of Defence, and in place of the nuclear airbase there is now a business park. But on the patch of land where the original Greenham women proclaimed their demands and refused to move, is a peace garden. The small square of heathland flourishes with wildflowers and surrounds a sculpture of a campfire engraved with the words, "You can’t kill the spirit." Sarah finally left the camp in 2000, and ever since has sought to establish a space for Greenham women within British memory. One of the first things she did on leaving the camp was to write a book. Greenham: Non-Violent Women v The Crown Prerogative documents the “serious work women did” which Sarah says she had to write because no one else would. 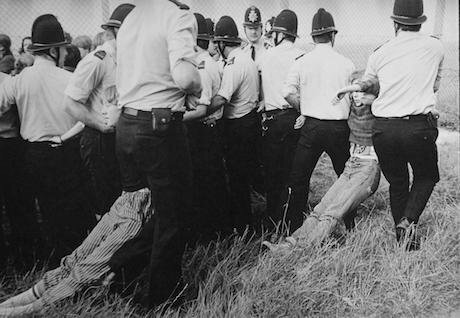 What exactly was Greenham Common? Think of any major protest in the West since 2008: Occupy, UK Uncut flash mobs, the fracking protests, Greenham Common was all of these. Except, it was mostly women involved, and they doggedly occupied a military space for nearly 20 years. I interviewed many Greenham women, some Sarah’s age, for a long-form article in Lacuna a new human rights magazine. All somehow retained an unrelenting belief that the world could, and should, be changed for the better. 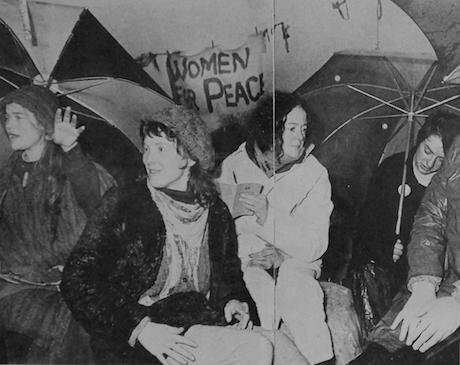 Women went to Greenham to protest against nuclear weapons and left liberated. Greenham Common peace camp created a generation of women ready and willing to commit their lives to challenging social injustice, whether through non-violent direct action for the disarmament of nuclear weapons, the campaigning for the rights of disabled children or providing practical support to refugees. Thirty years on, its legacy is still felt keenly by those involved. In 1984 the writer Angela Carter urged women to join Greenham and “rage as if again the dying of the light”. For a decade women raged. They protested against the bombing of Libya, supported the miners, raged against Section 28, the first Gulf War, and would go on to mobilise support for women in the Balkans. They stormed Parliament, and stood for Parliament, staged sit-ins, occupied buildings, defaced war machines, wrote letters, books and poems, danced and sang songs. They travelled to Europe and Russia, gathering ideas and inspiring others. They left home, school, and work to live in the open under great sheets of plastic where they plotted the end of the nuclear age. Read the full Greenham Common piece here and watch a short film about one Greenham woman over at Lacuna. Lacuna is a new online magazine that challenges indifference to suffering and promotes human rights. It aims to fill the gap between the immediacy of daily journalism and long-term academic analysis.